This is our review of the Precision Pro Golf NX7 Pro Review. Although there is only a $50 difference in price over it’s counterpart the NX7, the Pro version adds significant advantages. Score compiled from multiple sources. In our hands-on testing of the NX7 Pro, we were impressed by how quickly and easily it locked onto the flag and gave confirmation vibration. If you haven’t used a laser rangefinder with pulse vibration or Jolt technology, you might be surprised at how helpful it is. The accuracy of the NX7 Pro was good when compared with other rangefinders and consistent within a yard when rechecking the same target multiple times. We love that it has the Slope feature that can be turned off making it legal in tournaments that allow distance measuring devices. It’s a simple button press to switch modes. The actual distance appears below the crosshairs and the adjusted distance appears above the crosshairs. Although Slope can’t be used in tournaments, we think it’s a very helpful feature in practice rounds on new courses and also for helping you train your brain to make better estimates. 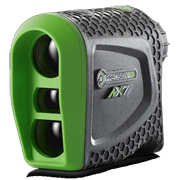 Our Precision Pro Golf NX7 Pro review wouldn’t be complete without discussing how it compares to similar rangefinders from Bushnell. Our comparison is to the Bushnell Tour V4 Slope and the Bushnell Tour V4 Shift, which only differ from each other in the way you turn the Slope feature on and off. The NX7 Pro has 6x magnification and both Bushnells only have 5x. All three models vibrate when they lock onto the target. We love this feature on all of them. Distance readings on all three models are very similar. On the NX7 Pro, switching to Slope mode requires a simple button press to a button on the top center of the rangefinder. The only other action this button is used for is switching from Yards to Meters, which requires a press and hold. Since you probably won’t be switching units of measure, it’s highly unlikely that you would accidentally turn Slope on during a tournament. The advantage that the Tour V4 Shift has is you must slide a switch on the side of the unit to turn Slope on or off. You can actually look at the switch to confirm that you are not in Slope mode. The Tour V4 Slope model has actually been retired by Bushnell presumably because the Slope Mode had to be turned on or off using the same button that you use for ranging the target, thus increasing your chances of making a mistake and turning it on during a competition. The difference in acquisition speed of the target was not noticeable. The ease of locking onto the target is good on all three units. The NX7 Pro provides measurements to the 1/10 of a yard. Although it sounds good in theory, since most golfers don’t need that much information, it isn’t really useful. In fact, when in slope mode, both the actual and adjusted number have decimal points, which makes it more difficult to make the mental calculation of how many yards uphill or downhill the shot is playing. Although it’s not a huge problem, we really wish the NX7 Pro would just round both numbers to the nearest whole number. Both Bushnell V4s display only whole numbers. The NX7 Pro only displays the adjusted distance to the target, while the Bushnell Tour V4s alternate between the adjusted distance and the degree of the elevation angle. Which you prefer is a personal preference, but having both might cause a slight delay if you have to wait for the display to alternate to your preference. The numbers on the NX7 Pro seem a little larger than those on the Bushnell models. In Slope mode, the NX7 Pro displays the adjusted distance above the crosshairs and the Bushnell models display it below the actual yardage and a little bit smaller. It’s a minor thing, but it takes a longer to make the eye adjustment to take in both numbers on the NX7 Pro. The size of all three models is nearly identical. All three units do a great job of targeting on the flag and on trees. However, the Bushnell V4s may do a slightly better job of hitting ground targets. All three of these models use the same 3-Volt lithium battery and will last for about a very long time. Precision Pro Golf offers free battery replacement for the life of the unit. All three models have a 2-year warranty. The price of the Precision Pro NX7 Pro is significantly less than either Bushnell model. Summary: The differences between the Precision Pro Golf NX7 Pro, the Bushnell Tour V4 Shift and the Tour V4 Slope are fairly minor, which makes the NX7 Pro an amazing value. Although we recommend the NX7 Pro without reservation, we think it’s worth considering your personal preferences as well as your budget when making your decision. As golf laser rangefinders typically last for many years, you may find it worthwhile to spend the extra money if you think the Bushnell is more suited to your preferences or if you prefer their long-standing track record for making quality golf rangefinders. Size (Width x Height x Depth) 3 in. x 1.5 in. x 4 in. Notes -Adaptive Slope Mode can be turned off to make this model tournament legal. FREE BATTERY REPLACEMENT for the life of the rangefinder. USGA Compliant (local rule) Yes, with Slope Mode turned OFF. We work very hard to obtain the correct information about product features, but cannot make any guarantees about the accuracy. Please double check with the merchant or manufacturer before making a purchase.